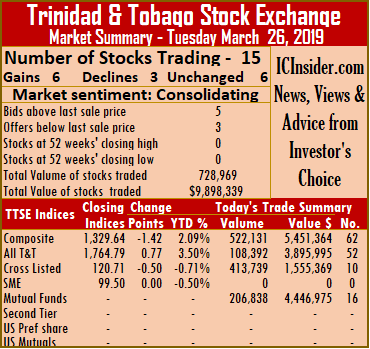 Trading on the Trinidad & Tobago Stock Exchange fell sharply on Wednesday, with a big drop in in volume and value of stocks changing hands. 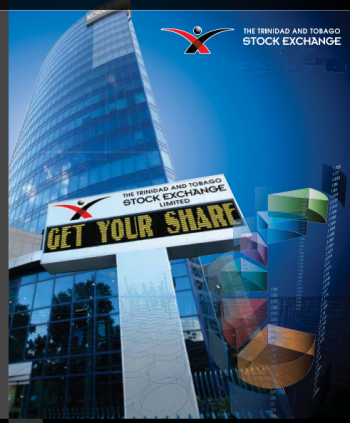 Trading ended with 10 securities changing hands, against 14 on Tuesday with investors exchanging just 80,535 shares for $942,914, compared to 146,470 shares for $3,700,163 on Tuesday. At close of the market, 5 stocks advanced and 5 remained unchanged, while Clico Investments traded at a 52 weeks’ high of $22.70. 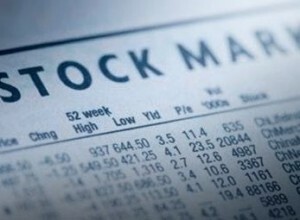 The Composite Index fell 0.06 points on to 1,328.41. 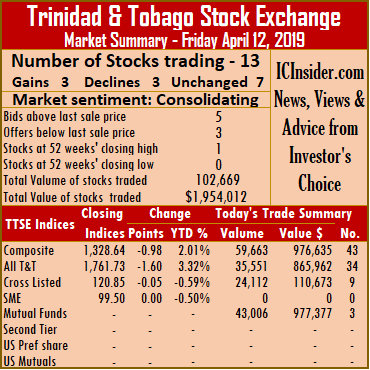 The All T&T Index declined 0.48 points to 1,764.77, while the Cross Listed Index gained 0.05 points to close at 120.36. At the close of the market, stocks ending trading with gains| Clico Investments closed with a gain of 20 cents at $22.70, with 2,000 stock units changing hands, Guardian Holdings gained 25 cents and completed trading 280 units at $18.50. Scotiabank finished trading 200 stock units after an increase of 1 cent to end at $63.01. 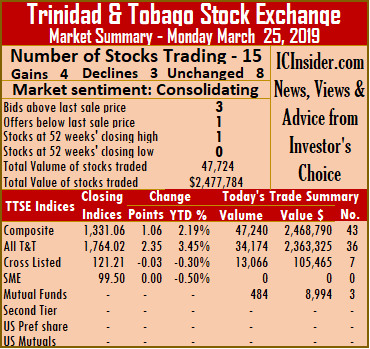 Trinidad & Tobago NGL closed trading at $30.50, after exchanging 7,000 units and Trinidad Cement ended trading 5,650 shares with a rise of 5 cents at $2.60. Stocks closing losses| There were no security trading at a loss at the close of the market. 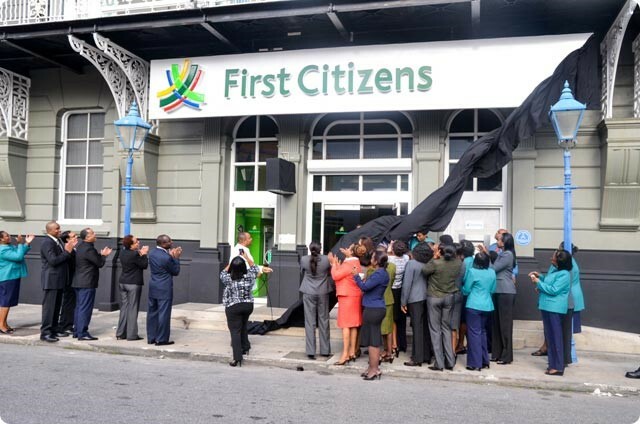 Stocks closing firm| First Caribbean International Bank completed trading of 500 units at $8.25, Grace Kennedy ended at $3.30, with 30,600 stock units changing hands, NCB Financial Group settled at $8.25, after exchanging 114 shares. Republic Financial Holdings closed at $119.50, after trading 2,221 shares and Sagicor Financial lost 15 cents and ended at $8.80, after exchanging 31,970 shares. 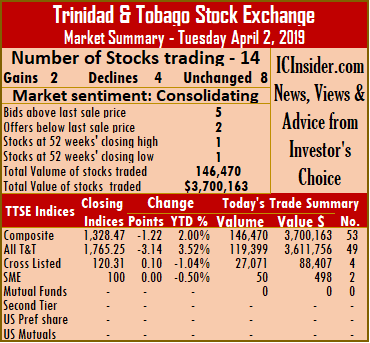 The number of securities trading on the Trinidad & Tobago Stock Exchange on Tuesday remained at 15 securities the same as on Monday, but the volume and value of trades jumped. At close of the market, with 6 advancing, 3 declining and 6 remaining unchanged. 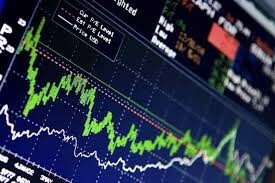 The Composite Index fell 1.42 points to 1,329.64. 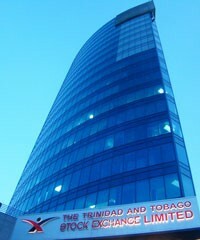 The All T&T Index gained 0.77 points to 1,764.79, while the Cross Listed Index shed 0.50 points to close at 120.71. 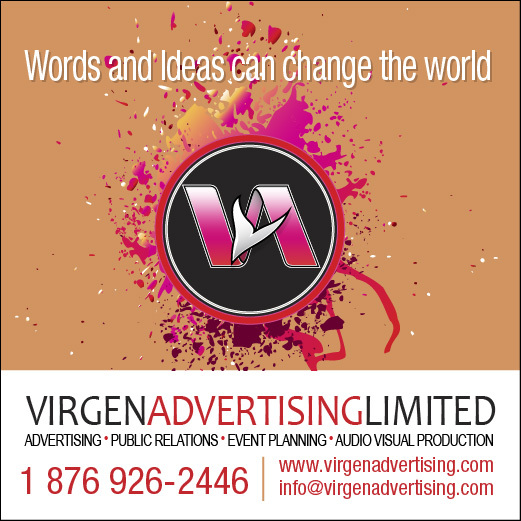 Trading resulted in a mere 728,969 shares valued $9,898,339 compared to 47,724 shares valued $2,477,784 changing hands, on Monday. IC bid-offer Indicator| The Investor’s Choice bid-offer ended at 5 stocks with bids higher than their last selling prices and 3 with lower offers. At the close of the market, stocks ending trading with gains| Ansa Mcal concluded trading of 91 units and gained 22 cents, to end at $55.24, Clico Investments rose 10 cents to end at $21.50, with 206,838 stock units changing hands, National Flour increased 5 cents and ended at $1.65, with an exchange of 1,450 units. 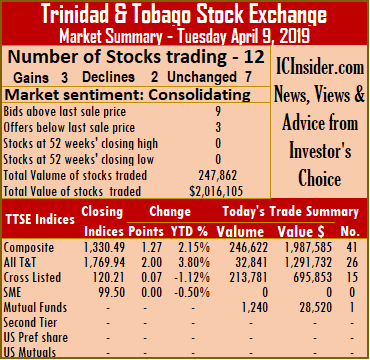 Republic Financial Holdings climbed 76 cents and completed trading of 6,734 shares at $118.76, Scotiabank closed with a gain of 2 cents at $63.53, with 656 stock units changing hands and Trinidad Cement gained 2 cents and completed trading of 969 shares at $2.52. Stocks closing losses| First Caribbean International Bank ended trading 10 cents lower at $8.25, with 21,000 units changing hands, Massy Holdings concluded trading with a loss of 25 cents and settled at $54.75, after exchanging 1,616 shares and Trinidad & Tobago NGL traded 94,939 units with a loss of 1 cent to end at $30.25. Stocks closing firm| Angostura Holdings closed trading at $15.80, with 440 stock units changing hands, First Citizens completed trading of 1,007 shares, at $35.65, Grace Kennedy endded at $3.25, with 373,689 stock units changing hands. 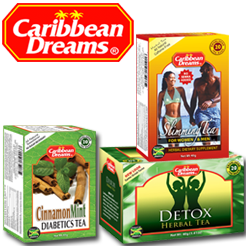 Sagicor Financial settled at $8.80, after exchanging 19,050 shares, Unilever Caribbean closed at $26, trading 50 shares and West Indian Tobacco ended at $96.06, with 440 stock units changing hands. 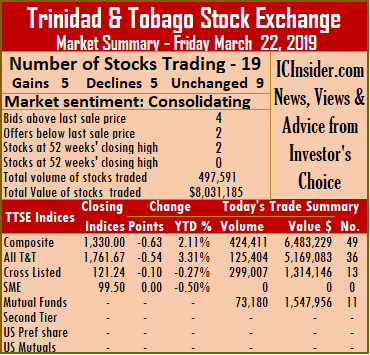 The number of securities trading on the Trinidad & Tobago Stock Exchange on Friday jumped to 19, compared to 16 trading on Thursday. At close of the market, 5 securities gained, 5 declined and 9 remained unchanged. Two stocks ended at new 52 weeks’ closing highs. 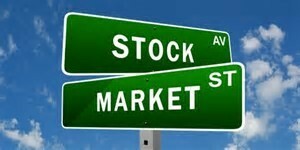 The Composite Index lost 0.63 points to 1,330. 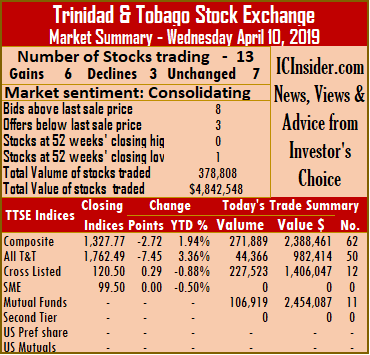 The All T&T Index shed 0.54 points to 1,761.67, while the Cross Listed Index fell 0.10 points to close at 121.24. Trading resulted in 497,591 shares at a value of $8,031,185 compared to 179,300 shares at a value of $3,629,056 changing hands, on Thursday. 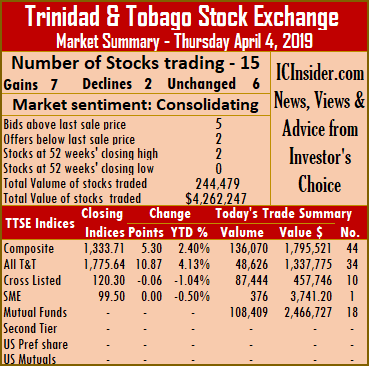 At the close of the market, stocks ending trading with gains| Calypso Macro Index Fund traded 138 shares and rose 45 cents, to close at $14.45, Clico Investments finished 20 cents higher and settled at $21.70, with 73,042 units trading. First Citizens rose 1 cent and ended at a 52 weeks’ closing high of $35.61, after exchanging 5,187 shares, Grace Kennedy added 12 cents and settled at $3.25, with an exchange of 231,405 units and Massy Holdings rose 1 cent and completed trading at a 52 week’s closing high of $53.01, with 200 stock units changing hands. Stocks closing losses| National Enterprises shed 4 cents to settle at $7.75, trading 1,354 units, National Flour lost 5 cents and ended at $1.60, after exchanging 791 shares, Republic Financial Holdings ended trading 75 cents lower and ended at $118, in exchanging 2,875 shares. 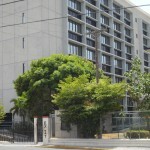 Sagicor Financial concluded trading with a loss of 10 cents at $8.90, with 1,606 stock units changing hands and Trinidad Cement lost 5 cents and ended at $2.50, after exchanging 2,000 shares. 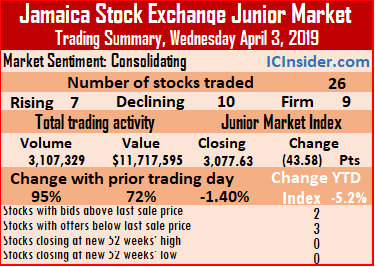 Stocks closing firm| Angostura Holdings settled at $15.80, with 2,219 units trading, Ansa Mcal closed at $55.02, after exchanging 3,000 shares, Ansa Merchant Bank ended at $38, after exchanging 100,000 shares, First Caribbean International Bank concluded at $8.35, after exchanging 400 shares. 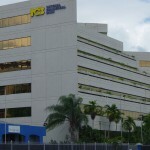 NCB Financial Group ended at $8.35, after trading 65,596 shares, One Caribbean Media completed trading at $10.40, with 185 stock units changing hands, Scotiabank settled at $63.51, with 2,446 units crossing through the market, Trinidad & Tobago NGL concluded trading at $30.25, after exchanging 550 shares and West Indian Tobacco settled at $96.06, with 4,597 units changing hands.